The patented 'loc-jaw' snap allows quick release for retrieving, and a positive lock to prevent accidental opening. Available in Camo & Orange. 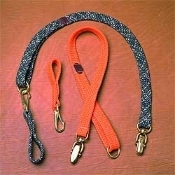 1" X 30"
Made with heavy Double Braid webbing and solid brass hardware, these leads are perfect for close control allowing hands-free use for hunting, training or exercise.